Need a last minute Christmas gift? Here at Two Horse Tack we want to make sure you find the perfect gift for the horse lover in your life. WE ARE GIVING AWAY FREE $10 GIFT CARDS for every 10 people who enter. Be the first, 10th, 20th, 30th …. person to enter and we will email the gift card Christmas morning to the recipient of your choice. Gift Card can be used for any item on our site. No purchase necessary, just click on link above and fill out form. Winners will be announced Tuesday December 24th. It’s time for another tack giveaway! If you didn’t win either of our last two tack giveaways, there’s still time! Our current tack giveaway is for a buckle-nose halter. This style is extremely popular in Europe, but it has just as many advantages on this side of the pond. This type of halter allows you to switch from the halter to the bridle without leaving your horse’s head free, a particular advantage for trail riders. The buckle nose option is also helpful for grooming if you have the sort of horse who likes to plant his whole head in the mud and gets dirt caked under the halter. It’s also a great option for the novice horse or rider to give the student confidence in handling the horse on the ground without removing the halter altogether. Our buckle nose halter has a double-buckle crown piece that allows for maximum customization of fit, a throatlatch strap for easy on and off, optional brass hardware, matching lead, and optional leather breakaway crown. You can also choose the width of your beta halter–between 5/8 and 1 inch. All you have to do is fill out the online form here to be entered between now and Dec. 31. All participants in the contest will be given a $5 gift card just for entering. Also, don’t forget that we’re offering a free upgrade to rush shipping for orders placed until the Dec. 21 to ensure they get to you in time for Christmas. Ever had friends or family ask you want for Christmas and watched their eyes glaze over as you explained exactly what size/style tack your horse wants you to find under the tree? Our website now has a ‘Wish List’ feature where you can choose all the options and sizes you like and save those preferences for shopping later on, or to give to a friend. Check it out and let us know what you think! Don’t forget to enter our current tack giveaway contest to win a buckle-nose halter. We’re extending our $5 gift card promotion connected with our giveaway–all entries get a free $5 coupon, win or lose. Congratulations to our tack giveaway winner! Congratulations to Maya B. of Arizona, who won a free two-in-one bitless bridle in our most recent tack giveaway! Maya is the proud owner of 19-year-old Arabian mare La Negra. When Maya got her, the mare was abused and neglected (think no farrier for three YEARS) and had been used for horse tripping. After two years of hard work, Maya tells us this gorgeous mare is finally back in fantastic shape. She still has a lingering quarter crack in one of her hooves due to years of neglect, but she has learned to trust again. The pair go trail riding across all kinds of terrain, swimming in the lake, and have played with barrels and jumps. La Negra is now relaxed and trusting enough to be a kid’s horse. Maya chose a bridle with aqua bling, which we think is going to look fabulous on La Negra. We salute you Maya, for making this sweet girl what she is today! If you entered our tack giveaway but didn’t get drawn for the bridle, have no worries–everyone is a winner! We opted to give everyone who entered a $5 gift card to our shop, which should show up as a coupon in your email inbox this evening. Feel free to share the coupon with friends and family–it’s a gift that keeps on giving! Even better, we’re still doing our ornament giveaway for all orders over $25 while supplies last. Also, take a look at our next tack giveaway here. An even merrier Christmas from Two Horse! For all you last-minute Christmas shoppers out there, we have a fantastic deal: today through Dec. 21, we’re giving our customers a free upgrade to rush shipping to make sure your tack gets to you in time to be under the tree! Also, if you’re still making your Christmas lists, don’t forget that you have the chance to win a two-in-one bitless bridle in time for holidays. Today, we decided to make that giveaway even better in the spirit of the holiday season–everyone who enters the contest will get a $5 gift card, whether they win the bridle or not. 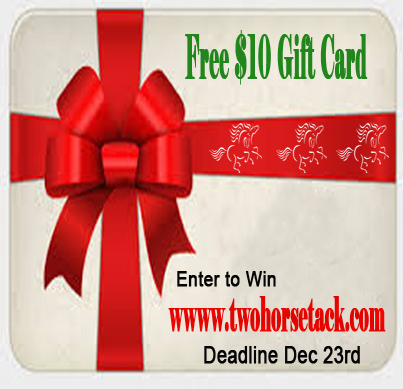 Don’t forget that gift cards are a great present for a horsey person if you’re not sure what size tack their horse needs. Check back on Wednesday for more Christmas shopping news! We’re dealing with a cold snap here in our offices and came across this awesome article via Facebook. 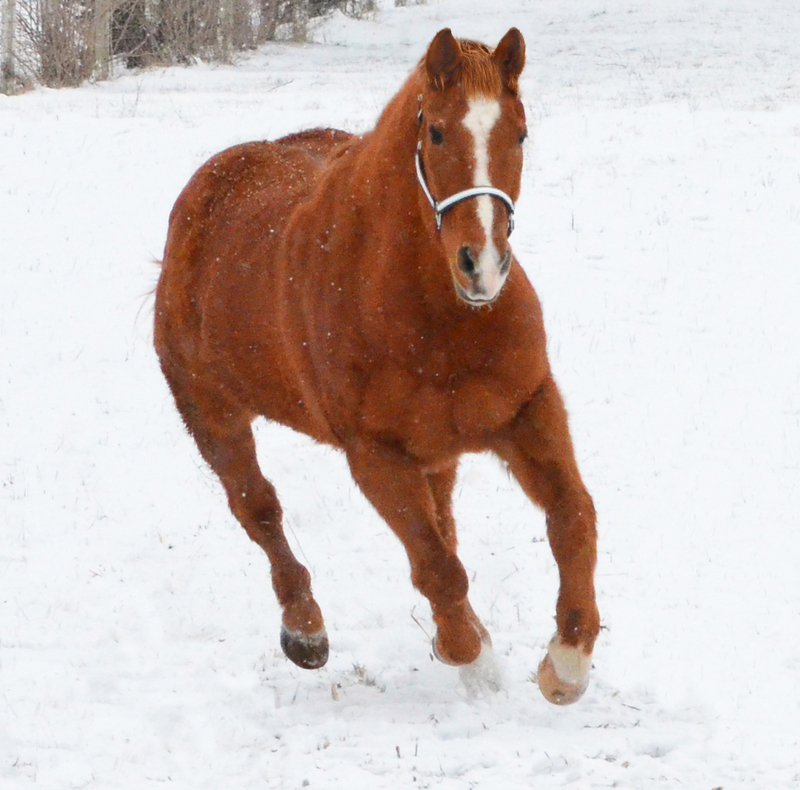 Pro Equine Grooms, which is a site we really love, has an arsenal of tips for cooling your horse off after winter exercise whether he’s clipped or not. You know what will help you feel warmer? A free two-in-one bitless bridle. Here’s how to get one.